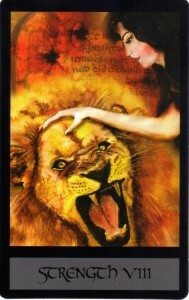 Although it is called the Joan Charles Tarot, this beautiful deck is actually painted by art student Berangere Toulet. 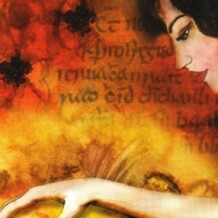 She was chosen from a submission of four artists’ work to give an artistic voice to the designs and Tarot knowledge of Joan Charles, author, psychic and columnist for the Scottish Sun newspaper. The Joan Charles Tarot is a traditional deck with 78 cards, the Major Arcana retaining their usual numbering and titles, and the suit names and Court Cards following the Rider Waite tradition. The cards are larger than normal Tarot cards, on the plus side allowing the images to be more easily seen, on the downside not great for those of us with tiny hands. They are printed on high gloss card stock, with black borders and the titles of each card in a silver box at the bottom of each card. This size of the cards, coupled with the bold colours, make this a striking deck to use. Some truly beautiful artwork can be found in this deck, with bold swathes and splashes of colour, elegant starscapes, intense characters and easy to read scenes. 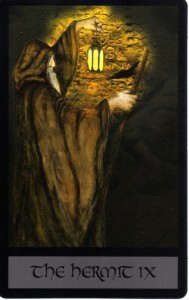 There are some really nice touches in the Major Arcana images that strike me as brilliant: the inner folds of the High Priestess’ robe showing us rich, red pomegranate seeds; the terrifying ferocity of the lion in Strength; the ancient carvings that are illuminated by the Hermit’s lamp, as if he is wandering beneath long-forgotten catacombs; the way that the traditional zodiacal creatures of the World card are entwined together in a living tree, the branches of which support the globe of planet Earth, in a symbiotic dance of life. Whilst the artwork in the Major Arcana is deeply traditional, it presents that tradition with a subtle twist and innovation. Those who like fully scenic Minor Arcana will be disappointed with the Joan Charles Tarot. Each of the Minors is illustrated with the backdrop appropriate for its suit, with the appropriate number of suit symbols on it. 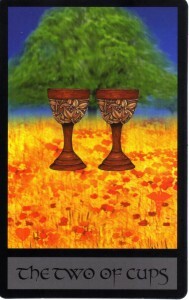 The Three of Cups is just three cups stacked together, for instance. In places there is possibly a suggestion that there was an attempt to convey meaning in the pattern the symbols were arranged in, such as the Nine of Cups, which has its cups arranged in what looks like a heart, but this does not seem to be consistent throughout the cards. However, there is a concession to the card meanings on the Minors, if you look very (very, very) closely (and make sure you’ve got your reading glasses on.) On each card, somewhere, are one or two very simple, single-coloured, almost silhouette-like images that relate to the card meaning. You have to hunt for them in some cards, and certainly the colouring in certain suits makes it difficult to find them in places (the Wands suit was particularly troublesome for me! ), but they are at least an original idea that I’ve not seen elsewhere in other Tarot decks. Many of these symbols are directly related to traditional Tarot symbolism, such as the dove (accompanied by a rose) upon the Ace of Cups, which links to the image of the descending dove bearing a communion wafer in the Rider Waite image. 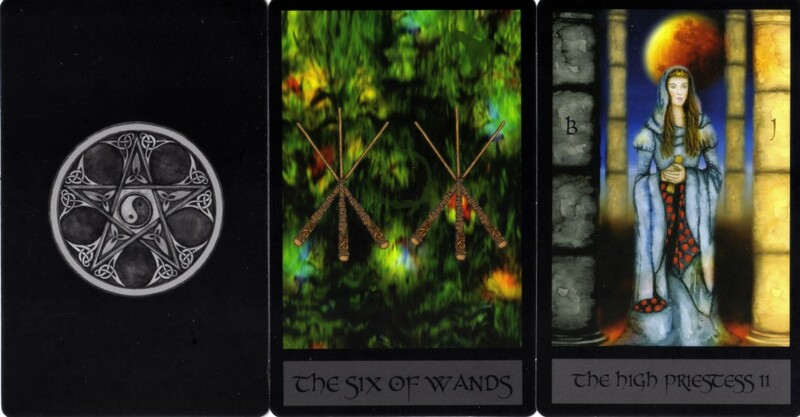 Others are more abstract but still convey meaning, such as the key upon the Four of Pentacles (actually found in the centre of the arrangement of four pentacles, as if boxed in), the winding road on the Eight of Wands, and the waterfall on the Five of Cups. Some of these symbols are very easy to read, and would be easily understood by even the most literal of people: the heart split in two on the Three of Swords, the shackled wrists on the Nine of Swords, the fireworks and clinking champagne glasses on the Three of Cups. Each suit has a different colour scheme and a hint of a season: the Swords are set to a backdrop of wintery ice blues and white, the Wands are full of the lush, vibrant green of Spring, the Cups are the beautiful contrast of red poppy fields with blue sky and green trees suggestive of Summer and the Pentacles are the browns and greens of Autumn leaves. Similarly, the Court Cards share their suit’s colours, with the Court of Swords wearing purple cloaks or dresses, the Court of Cups is varying shades of blue, the Court of Pentacles in greens and browns, and the Court of Wands in gold. Although at first I was disappointed with the Court Cards because they lack symbolism, I realized that their stances, postures and interaction with the suit symbol was actually quite meaningful and easy to read. For instance, the Queen of Cups appears to be dreaming or daydreaming as she stares at her cup, the Knight of Swords kneels in the snow with his sword point downwards to provide balance, as if he is searching for tracks, the Queen of Wands sits open-armed upon her throne and stares directly at us, and the Princess of Pentacles holds her pentacle in both her hands and studies it carefully. A beginner still might find it difficult to remember card meanings with these Court Cards, but once familiar with them, the figures in these cards could become very real personalities. The card backs are bold and striking, being completely black apart from a silver-grey version of the Celtic-style Pentacle design used throughout that suit. A quick quick suggestion for those buying the Joan Charles Tarot: you will need to get a new deck box or bag to store it in, since the deck is so tightly packed into its box that after one or two shufflings of it, I could not get it back in without bending a card with the force of my attempt! This is a deck that I can see becoming very popular with beginners, and certainly its association with Joan Charles and the Scottish Sun newspaper will help push Tarot further into the mainstream, bringing new enthusiasts to the art. However, it does not come with any companion book, giving us only two cards with a few keywords for the Major Arcana, meaning that for those who start Tarot with this deck, other sources of information will have to be used. The Joan Charles Tarot is attractive and aesthetically pleasing, and more experienced readers will enjoy seeing the traditional Tarot archetypes presented in this striking and dynamic manner. However, I feel that the deck is let down by the Minor Arcana, since the Majors are so stunning and clever, whereas the Minors feel like they were rushed, tacked onto the end of the project, and slightly lazy. I’d love to see more of Toulet’s art, particularly pertaining to Tarot and the esoteric, and hope that in coming years she has more to offer us. Interesting comments Kim, thank you for your insight although i would have to say there was no rush element in the minor cards, they were meant to be this way for the reason that people can use their own intuitive skills to find things in the backdrop and most who have used them would say they find something different every time they look at them so this was what i requested having taught intuition for well over 30 years it can be more lazy to have everything put there right in front of you and i so try to sway my students to look deeper at things for what the intuition will throw up. i take on board the point about the box but would say most readers i know have their own bag, or box that they keep their cards in and not the original box but that said it is a fair point. Berangere was amazing not only in her art work but also in the fact that she really listened to what I wanted and there were very few changes as a result of this – she is herself very intuitive and there were some points where she would say” I didn’t mean to or see that in the sketches” but whatever was there was obviously meant to be so it was no coincidence. There is no book and perhaps i have done things back to front here but, that will be a project and i always feel things are what they are supposed to be but thats only my thoughts on it. In my small way i try where ever possible to get the Tarot recognised for it’s amazing qualities and have even used them in the corporate world in many areas from; HR, Team building, creativity and coaching and so i pride myself on taking them into areas that my perhaps would have had barriers to this divination tool but my plan is to continue my work in raising awareness on the value of Tarot.